RECORD A FULL LENGTH CD! With an incredible 29 novels under his belt as a mystery/crime novelist since the late ‘80s, Jeffery Deaver –the internationally acclaimed bestselling author Newsweek calls “a suspense superstar”– has sold books in 150 countries and had his work translated into 25 languages. Three of his titles have been turned into films, most notably The Bone Collector, starring Denzel Washington and Angelina Jolie, and the HBO production Dead Silence, based on his A Maiden’s Grave, starring James Garner and Marlee Matlin. Deaver has topped bestseller lists in the New York Times, London Times and Los Angeles Times, and has been nominated for seven Edgar Awards from the Mystery Writers of America and numerous other accolades in his genre. In 2011, he was tapped to write the latest James Bond novel Carte Blanche. But how many of his millions of fans around the globe know that his first love is music? Long before he was keeping readers up at night, scared but still turning pages, Deaver aspired to be the next Bob Dylan or Paul Simon– and performed original songs at clubs from his hometown of Chicago to San Francisco, where he moved after receiving his journalism degree from the University of Missouri. A few decades after that dream took shape, Deaver has at last found the perfect voice to help him share his formidable songwriting talents: Kayleigh Towne, the beautiful and talented pop/country singer protagonist of XO, the third novel in his series featuring heroine Kathryn Dance, released June 12, 2012. 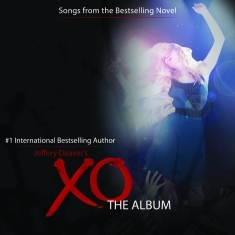 The companion music recording ”Jeffery Deaver’s XO (The Album),” released May 29, 2012 worldwide and available on sites such as iTunes, Amazon, Emusic and CDbaby, features 11 songs with lyrics by Deaver and music by songwriters Clay Stafford and Ken Landers. It is the first release on the musical imprint of Stafford’s Nashville based multi-media production company, American Blackguard. Stafford himself is an internationally bestselling author, in addition to working in the film industry for years as writer, director, producer and actor. His retellings of American children’s classics released through Dalmation Press have sold over 1.2 million copies in the U.S. alone, and he has worked as a film development and production executive at Universal Studios and PBS. As a composer and record producer, his scores can be heard on everything from TV movies to commercials. A renowned composer and sound engineer, Ken Landers’ live and studio recording credits include Trace Adkins, Pat Boone, Elvis Costello, Steve Earle, Peter Frampton, Vince Gill, David Byrne, Alan Jackson, Louise Mandrell, Kathy Mattea, Michael McDonald, Tim McGraw, Willie Nelson, N’Sync, Oak Ridge Boys, Marty Stuart, Travis Tritt, Hank Williams, Jr., ZZ Top and others. In the novel XO, the gorgeous “Kayleigh,” a Taylor Swift-type performer who becomes the target of a crazed stalker fan, is rising to the top of the country and pop charts with her hit single “Your Shadow” – the opening track of the album and is available as a free promotional download from the XO website (www.jefferydeaverxomusic.com). Deaver fans can listen to the clues contained in the song as they read the book, joining along with detective Dance. Other listeners can just enjoy the infectious country pop songs on their own – think Swift and Miranda Lambert with a touch of the Paul Simon poetics, and you’ll get the vibe Deaver and his crew are aiming for. Deaver first met Stafford two years ago at Killer Nashville (www.killernashville.com), an internationally attended, volunteer-run annual conference focusing on crime, mystery, thriller and suspense literature that Stafford launched in 2006. When his Executive Director Beth Terrell asked him who his ideal guest of honor would be, he chose Deaver but never thought he’d get him – until he got him! The two hit it off and about six months later, Deaver emailed Stafford and asked if he knew of any record producers in Nashville. Stafford informed the author that American Blackguard was developing a new record label. Deaver explained the plot of XO – and the clever device of using the singer’s songs to determine where the killer is going to strike next. He had written the lyrics to “Your Shadow” and was looking for someone to write the music for it and produce it as a single. The collaboration between Stafford, Landers and Deaver on the song was so seamless and productive that Stafford suggested doing an entire album of songs based on the lyrics used in the book. “Ken and I had just recorded a classical album that we had slotted as the first release by American Blackguard,” Stafford says, “but we decided to put it on hold as the vision of this project took shape and we realized its creative and commercial potential. We edited down some of Jeff’s verses and chose different songs to work on individually. Then we got back together and fine tuned them. Because of my background in the record business, my thought was all about creating songs that could play on commercial radio and become pop hits. We’re both veteran arrangers and when we started to produce the tracks, we knew just the right touches to bring out the pop country vibe – like fiddle, mandolin, slide guitar. Living and working in Nashville, we had access to some great musicians who brought these tracks to life. On August 25, 2012, after a busy summer of numerous separate appearances by Deaver, Stafford, Landers and Blomquist, the four will get together at this year’s Killer Nashville event at the Hutton Hotel, where the songs from the album will be performed live by Blomquist and the Nashville musicians who created it. The band will also perform cover songs.